I have always loved Taste of Home Magazine! 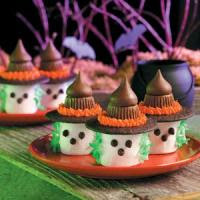 There is still time to spend your Saturday making tasty treats for Halloween for those you love. We are officially ready for the Christmas Season with all our holiday decorations out on the floor of each shop. 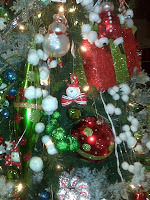 We have some great stuff and I will be posting photos here and there on the blog with our Christmas Count updates. Holiday Open House Is Coming Soon! Mark your calendars for Friday and Saturday, November 6th and 7th for our Holiday Open House at both locations. You will received a FREE GRAB BAG ($100 worth of stuff) with a $100 purchase-Limit one per customer. Also 20% off any one item (excluding Pandora Jewelry). We also have some other surprises I will post later! Knock 12 people off your to-buy-for list...and for less than $20/ea! For your favorite kiddo: Melissa & Doug Jumbo Coloring Pad, Sticker Collection & 10 Jumbo Triangular (so they don’t roll off the table!) Crayons (Melissa & Doug art supplies are buy 2, get 1 free---so you buy the coloring pad & sticker collection and the crayons are free!) Just $13.98 +tax! For your favorite student: FRILL LOL (pencil pouch for a 3-ring binder) $12, Smencil Scented Pencil $1.50, Snifty Pen $2.50, Fun Collectible Eraser $1.50! All for just $17.50 +tax! For your favorite teacher: Vera Bradley Lanyard $10, Vera Bradley Binder Clips $6, only $16 +tax! For your favorite wine aficionado: Woozie (koozie for your wine glass) $9.99 with a monogrammed initial for $6.99, add a Wine Cork Candles $2.50/ea, 6 Stylish Stems (to decorate and distinguish your wine glass) $13.99, Initial Monogrammed Wine Stopper $12.99 (Elkin store EXCLUSIVE!) 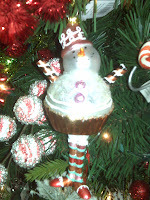 Create a fabulous gift and have money left over for a bottle of vino! For your favorite food-y: Southern Twang BBQ Sauce (Mild or Hot—Made in NC!) $7.99, Southern Twang Dry Rub $4.99, Wind & Willow Cheeseball Mix $4.99, Country Home Creations Dip Mix $5.99 Mix & match these ideas for a yummy gift under $20! For the trendsetter: Twist & Pout Lip Balm $6.99, Flower Headband (Pink, White, Black or Blue) $12.99, Funky Bangles (Inspirational Words or Art Deco Designs) $13.99, Primal Elements Soap $8.99, Rhinestone Initial Key Ring $8.99-give one, or give a couple for a gift sure to please—and for under $20! For the entertainer: 30 Party Picks $13.99, 6 Stylish Stems (to decorate and distinguish your wine glass) $13.99-these are great hostess gifts, too! For the “green” girl: Woodwick 3.4oz Green Candle (Burns up to 40 hours) $10.99, Small Natural Life Water Bottle $12.99, Recycled Tin Mini Frame $5.99, Envirosax Reusable Tote $8.99. Give her any of these for less than $20! For the flower child: Natural Life Button Ring $5.99, Natural Life Mirror $4.99, Natural Life Playing Cards $5.99, Natural Life Mini Notebook $5.99. Give any three of these for under $20! For the kitchen diva: Ergonomic Hand Peeler (peels your veggies, not your hands!) $4.99, Tomato Saver $4.99, Natural Life Kitchen Towel $13.99. Gift a kitchen towel & a kitchen gadget for less than $20! 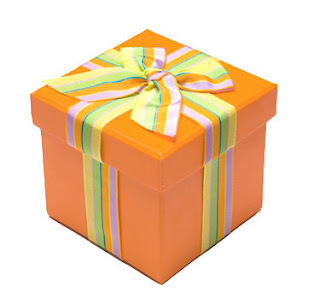 And as always, we gift wrap for free! 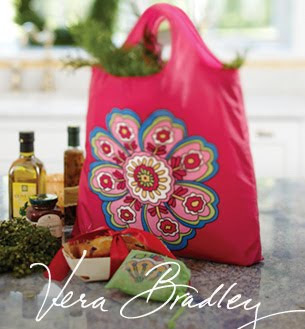 New Vera Market Totes- Colorful & "Green"
Get Caught in Our Friend Web CONTEST!! No tricks, all treats! For the month of October, we're running a FRIENDLY competition! This contest is super easy! Simply invite your friends to join our page, have them post a message on the discussion board telling us you referred them, and WIN! Step 1: Invite all of your friends to join our page. Step 2: When they join, they MUST post a message on the discussion board with YOUR name in it so we know who referred them to our page. Sample message: My name is Mary Smith and I was asked to join your page by Kim Smith. You, the referrer, must ask your friends to post, and YOUR name MUST be included so we know whom to thank (and to keep tabs on the contest so we know who wins!). Step 3: Keep doing this all month long! We'll keep tabs on who is sending us the most new friends! There will be a $25 gift certificate awarded to the winner that may be used at either Ivy Ridge Traditions location. You have until the end of the month to invite friends, and once your friends join, they can also join in the competition and invite their friends! This way, we'll be able to communicate with more of our friends & customers! Good luck! I found that we rarely cook sweet potatoes unless it is around the Holidays; however when a sweet potato is compared with all other vegetables-it ranked number 1 in nutritional value! Sweet potatoes are rich in complex carbohydrates, dietary fiber, beta carotene (vitamin A equivalent), vitamin c and vitamin B6. I have made the following recipe two different times and put in the fridge to eat throughout the week and loved it each time! Heat oven to 500 degrees. Spray 13x9x2 rect. pan with cooking spray. Place sweet potatoes, carrots and onions in pan. Mix dressing and red pepper and pour over vegetables. Cover and bake 10 minutes. Stir green peppers into vegetables. Cover and 5 minutes; stir vegetables. Bake uncovered 10 minutes longer. Serves 6 for around 1 ww point per serving. Exercise update: I have walked 3.5 miles this week...so I am trying to get some movement into the week! However this is the first week, since I posted the exercise post that I have gotten out...next goal to join the YMCA! 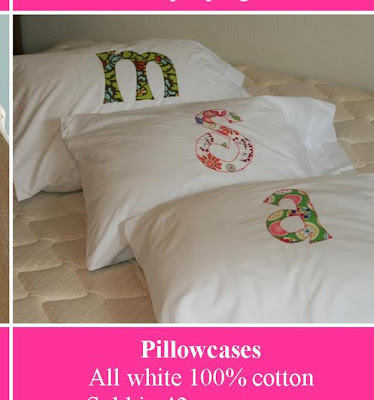 These pillow cases are one of my favorite monogrammed items we have ever had at the shops. We have two fun fabric options to choose from and get yours now while we have a great selection of all letters. $21.99 retail and available at our N. Wilkesboro and Elkin locations.